We offer complete dental care for your child. Welcome to Glen Park Dental. We are a family dental practice serving the Glen Park community. Our services are provided in a comfortable, clean, state-of-the-art facility equipped with latest dental technology including soft tissue lasers, Cerec one-day restorations, digital x-ray. Our commitment to go green by being “paperless” and using environmentally friendly products is visible throughout our dental office. Our doctors are highly trained in treating patients with TMJ disorders suffering from migraines. Drs. Longa and Dickerson also work with local sleep physicians to treat patients with sleep apnea and/or snoring. We see patients of all ages and provide comprehensive dental options including cosmetic dentistry, orthodontics, implants and more. I am a Northern California native, born and raised in Los Altos. I graduated from U.C. Davis in 2012 with a degree in Biology with an emphasis in Neurobiology, Physiology, and Behavior. After graduation, I took a year off to give back to my community. I volunteered my time at Ravenswood Family Dentistry, a community clinic in East Palo Alto. I volunteered with the CDA and worked as a dental assistant. I received my dental education from the University of the Pacific, Arthur A. Dugoni of Dentistry in San Francisco. I graduated with honors in June 2016 and have been practicing since. I joined this practice in February of 2018 and hope to maintain the same outstanding patient care and high standards that have been set by this practice. In my spare time I enjoy catching up with longtime friends, traveling, spending time outdoors and spending time with my family. I am a big Bay Area sports fan; love the Sharks, 49ers, Giants, and the Warriors. I always knew I wanted to be a doctor, but I never thought I would be a doctor of dental surgery. The seed of dentistry wasn’t planted until after college when I returned to San Francisco and started working for a grant project to increase access to oral health care for persons with developmental disabilities through the University of the Pacific Arthur A. Dugoni School of Dentistry. Three years later, the associate dean of the dental school finally convinced me that I was destined to be a dentist. During dental school I was humbled when the student body and faculty awarded me “Most Compassionate Student Award” in 2005. My role as a dental educator and advocate for disabled persons prior to dental school has fueled my passion for helping others and continued during and after my doctorate. Born and raised in San Francisco, I am proud to be a native San Franciscan. I love this city and for the past 8 years I have really embraced the neighborhood of Glen Park as both a resident and business owner in this community. The small town feel of Glen Park is a wonderful departure from the all too familiar hustle and bustle of San Francisco and I feel blessed to have my home and work all within the tight-knit community of Glen Park. Dentistry is no longer just a matter of diagnosing cavities and filling them. The role of the dentist has expanded to screen and treat various systemic conditions which arise or manifest in the mouth such as oral cancer, herpes, HIV, sleep apnea(OSA), diabetes, hypertension, TMD, migraine headaches and facial pain. All of these conditions have an oral component and most dentists are not educated in this arena because it is not taught in dental school. It is up to the dentist to learn about these potentially life-threatening conditions so that they do not go undiagnosed and untreated. It is our mission at Glen Park Dental to stay at the very forefront of dentistry and all it has to offer our patients. Education is never-ending, especially in health care. We will never know everything there is to know when it comes to health, but we must strive to do so, because in the pursuit of perfection we can achieve excellence. I believe in a patient-centered, interdisciplinary approach to health care. Prior to my career as a dentist, I did research in the field of radiation oncology thru UC Irvine Medical school. As a research scientist, it is well understood that the greatest benefit from science comes from the sharing of information; however, this principle is often lost in the field of healthcare. At present, our healthcare system is centered around treating illness rather than preventing it. Here at Glen Park Dental, we collaborate with oral surgeons, endodontists, periodontists, primary care physicians, sleep physicians, chiropractors, massage therapists, acupuncturists and anybody who will listen and contribute to the common goal of keeping our patients healthy. One of the most fulfilling aspects of dentistry is that in most cases, things can be prevented. It is our goal to educate patients on how to maximize their oral health in an effort to minimize the amount of dentistry they require in the future. Our primary objective is to educate and elevate the systemic health of all our patients. Our best reward is patient satisfaction and we stop at nothing to achieve a level of care above the rest. My journey as a student is never ending but the start of that journey was at St. Brendan’s Elementary School. Following St. Brendans, I took a drastic departure from private Catholic School and went to Lowell High School and graduated in 1996. Undergraduate education was completed at University of California, Irvine with a Bachelors of Science in Biology. Followed by Dental School at the University of the Pacific, Arthur A. Dugoni School of Dentistry. I have pursued various postgraduate education courses including the California Center for Advanced Dental Studies and the California Dental Society; however the place where I transformed into a comprehensive oral health provider was at the Las Vegas Institute for Advanced Dental Studies. My enthusiasm for dentistry stems from helping my patients learn about the connection between their mouth and body. Teeth, gums, TMJ, and your airway can all have a direct impact on your overall health; and, when healthy, can significantly reduce the risk of serious disease. My primary goal with every patient is to make them comfortable in our office and educate them about their oral health. Born and raised in Las Vegas, my dental experience began at a very young age working in my father’s dental office. After college at Santa Clara University, I realized my passion for helping patients while working in the marketing department of LVI, a postgraduate dental institute teaching aesthetic and neuromuscular dentistry. From observing and experiencing the difference the dentists were making in the lives of their patients, I knew I wanted to provide the same type of excellent care. I believe in providing patients the highest quality dental care in a calm, comfortable environment. I also recognize the importance of giving back to your community and have worked with the underprivileged. A few of my best experiences have been participating in dental missions to provide much needed dentistry to populations without access to dental care. I enjoy being involved in local non-profit organizations and have volunteered much of my time since 2009 to planning the annual Glen Park Festival which takes place in the Glen Park Village each spring. It is a wonderful event for our community and all proceeds go to grants for the local schools in the neighborhood. Above all, my greatest fulfillment comes from my family. 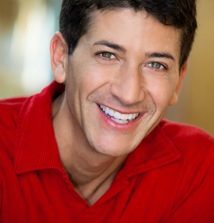 My husband (and partner dentist at Glen Park Dental!) and I are raising two young boys in the neighborhood and loving it. We value family time and spend our weekends enjoying all that San Francisco has to offer our growing family. In my free time, I enjoy outdoor activities including hiking, running, snowboarding, and biking. I love to travel and lived in Madrid, Spain during college where I refined my Spanish language skills. I received my Bachelors of Science in Marketing, Santa Clara University; Doctor of Dental Surgery from University of the Pacific School of Dentistry, San Francisco, CA; and earned my Fellowship from the Las Vegas Institute of Advanced Dental Studies. I am committed to providing my patients the highest quality dental care, and strongly believe that continuing my dental education to advance the horizon of oral health care is an essential part of patient care. I have completed numerous courses at the prestigious Las Vegas Institute (LVI) in many areas including aesthetics, advanced adhesives (bonded, metal-free dentistry), neuromuscular dentistry, TMJ/TMD and sleep apnea. I am also certified in Invisalign, and consistently take courses on treatment to align teeth. I stay involved with local and national dental organizations and am a member of the San Francisco Dental Society, the California Dental Association (CDA), the American Dental Association (ADA), and the International Association of Physiologic Aesthetics (IAPA). In 2014, I earned the great honor of becoming a Fellow of the Las Vegas Institute for Advanced Dental Studies. Tom grew up in a rural community in the East Bay. He spent his summers working locally as a lifeguard and with park maintenance, and later as a recreational youth counselor in Hawaii. Tom received an outstanding freshman scholar award and a B.S. degree in biological sciences with a minor in chemistry from CSU Hayward in 1984. 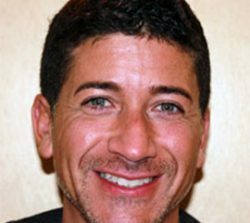 He was a preceptor and teaching assistant at UCSF department of restorative dentistry. He received the Mark Brown fixed prosthodontic award for excellence in 1986. Tom received his DDS and BSDS degrees from UCSF in 1988. 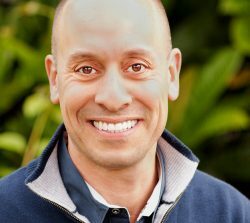 Tom has been as associate dentist in San Mateo since graduation and joined the Glen Park Dental team performing dental hygiene and soft tissue management procedures since 1996. Tom has many hobbies including photography, sculpting and travel. His real passion is bicycling. Tom rides 8,000 to 12,000 miles per year. He has explored most of California by bicycle, completed numerous events and races including: time trial races, double centuries, a Northern Transcontinental ride in 1997, Paris-Brest-Paris in 1999 and 2003, Florida to Maine in 2000, Canada to Mexico in 2001, and the Furnace Creek 508 in 2002. Don’t forget to ask him about the latest Star Trek trivia! Dr. Ariana Ebrahimian provides orthodontic services at Glen Park Dental. She brings expertise in Biobloc Orthotropics® for young children and Neuromuscular Functional Orthodontics for teens and adults. 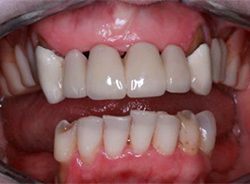 This unique approach is about more than just straight teeth. It helps maximize overall health by emphasizing healthy jaw joints, an open airway and a balanced facial profile. Her advanced training in orthodontic services is unique and Glen Park Dental is proud to be the only office in San Francisco offering Biobloc Orthotropics®. Dr. Ebrahimian firmly believes in early intervention, and screens children as young as age 5 so she can begin assessing their needs to help them build a beautiful, radiant smile. Dr. Ariana Ebrahimian has advanced training in neuromuscular dentistry and sleep disordered breathing dentistry from The Las Vegas Institute for Advanced Dental Studies (LVI Global) which makes her uniquely qualified to diagnose and treat problems resulting from an improper bite, poor oral posture, or a constricted airway. Commonly these include headaches, temporo-mandibular disorders (TMD), facial pain, orthodontic problems, and sleep problems. Helping children to avoid these problems later in life is a passion for Dr. Ebrahimian as she witnessed her own sister battle with obstructive sleep apnea. We offer convenient payment and financing options to help you afford the care you need. Our LVI trained dentists can place ultra-thin natural looking porcelain on uneven, chipped, discolored, or worn teeth to give you the smile you’ve always wanted. When teeth, muscles and joints are in harmony, symptoms associated with TMJ dysfunction can be alleviated. Agnes has had a life-long fear of dentists. The thought of sitting in a dental chair and others peering into her mouth terrified her. As a result, now at age 70, she has lost all of her lower teeth from decay and neglect. While generally a happy person, she avoids smiling as much as possible lest show the empty space in her mouth. After discovering that she might lose the few remaining teeth, and noticing how even simple things like eating and drinking are becoming increasingly difficult, she sought help. Dr. Dickerson who immediately replaced her bridge and added two partial dentures to complete her teeth. Agnes now smiles enthusiastically - looking and feeling great - making sure everyone sees ALL of her teeth. Eating and drinking are enjoyable again. 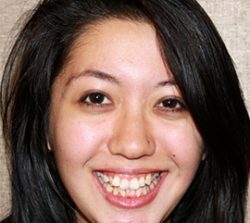 Her new teeth are now filling up what used to be a sunken and drooped area on her face, revealing her natural beauty. Above all, Agnes has overcome her life-long fear of dentists. Now each visit to Glen Park Dental is a reminder of the many significant and gradual improvements on her appearance and health. Sally always felt a slight panic when anyone asked her to be in a photo. If she smiled too wide or opened her mouth slightly too much, her silver fillings would be visible in those pictures. This always caused a bit of anxiety because she never knows who will see them in the future. With her wedding coming up, she decided to address the problem. Vowing to not let silver fillings get in the way of showing her happiness in the most natural way on the most important day of her life, she sought help from Dr. Kimberlee Dickerson. 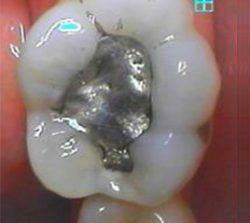 Understanding the importance and significance of this decision, Dr. Dickerson removed her silver fillings and replaced them and the decay that was underneath, with bonded composite filling. Sally's wedding was beautiful and her picture was truly worth a thousand words. Michael decided it was time he committed fully to his acting career and move to Hollywood. Given the competitiveness of the field, he knew he had to look perfect. He was generally happy with his looks except for his teeth. He thought they could be straighter and whiter. His challenge was perfecting his teeth in a short period of time. He was planning to move the next month. Fast results were not something he was able to find from the other dentists. 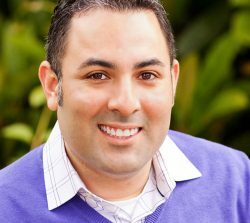 For Michael, veneers gave him the results he wanted so he could hit the ground running in Hollywood. He completed the veneers on his upper teeth in just 2 visits in 2 weeks. 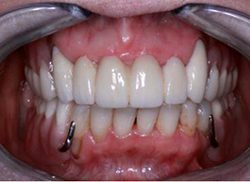 On Dr. Dickerson's suggestion, he agreed to a slower approach to straighten his lower teeth since they aren't as visible. He completed Invisalign treatment on his lower teeth over a 9 month period by seeing Dr. Dickerson every few months. Today, he's continuing to pursue his dream with the confidence he now has with his new smile. Ronen is a top executive and because of his high-profile job, he presents regularly in front of large audiences and participates in executive and client meetings. It is important for him to look his best. To maintain his professional appearance, he initially came to Glen Park Dental to whiten his teeth to eliminate the yellow blotches on his teeth. 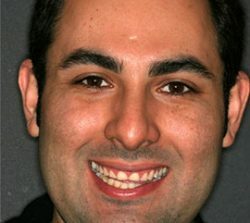 Unfortunately for Ronen, whitening was not an option due to existing dental work in his mouth. During our discussions on possible solutions, he also confessed how much the gap between his teeth and unevenness overall bothered him. After eliminating the decay from his teeth, conservative veneers were used to cover up his gap and discoloration. Ronen had no idea that he had so many options available to him and wondered why he had waited so long. Sara recently moved to San Francisco to attend college. New to the city, she set a goal to meet as many new friends as possible. One thing that held her back from being as outgoing and confident as she could be, was her smile. She felt her teeth were crooked and often her gums were red from inflammation. 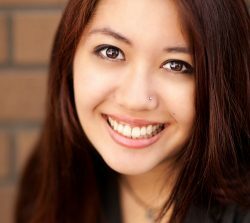 After hearing about her social goals, Dr. Dickerson fitted her with Invisalign, invisible braces. After several months, Sara noticed her teeth starting to straighten, and was also pleasantly surprised to find there was less inflammation in her gums. The redness was gone along with the bleeding. Sara's teeth are no longer a burden but an asset in portraying the right image she had in mind for herself as she sets out to meet new people in the new city. 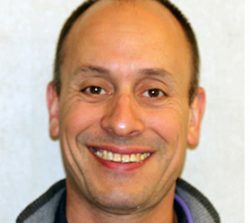 John is an outgoing, friendly person who loves socializing and having fun. He also works very hard and spends a lot of his time traveling abroad meeting with international clients. John realized he was uncomfortable with his teeth, both with sensitivity and lack of confidence in smiling. John had severe wear on his teeth from grinding on them throughout his life. Dr. Dickerson discussed options with him and the importance of getting his bite right so he didn't further damage his teeth. If he kept going in this direction, he would have ended up wearing his teeth down to the gums and possibly needing multiple root canals. After restoring his bite to it's proper and functional neuromuscular position, he no longer grinds, and has no sensitivity, smiles that great smile as much as possible! "These people are the best. They have made me feel so welcomed, supported and heard. They are very thorough from start to finish. Like most people, I don't like dentist appointments. They work above and beyond to make you feel comfortable and at ease with your situation. They're straight with you, and they give you a clear plan and understanding of why they suggest what they suggest (but it doesn't feel like they're trying to charge you more). I *always* cry at the dentist (I had traumatic dentist surgery as a kid), and they are super empathetic. You're in great hands (literally!) with the entire family at GPD." As you know, I suffered from serious headaches most of my adult life and had become all too accustomed to one or two a week in recent years. So I hope you’ll forgive me for having been pretty skeptical the times you encouraged me to try the new orthotic you were finding so helpful to patients with similar complaints. I cannot tell you how relieved I am to admit that you were right and that I was wrong to be so slow in following your great advice. Since you fitted me for the high tech, neuromuscular orthotic in January, I have worn it every night and have now gone many months without a headache. Even if I ever begin to take this pain-free way of life for granted, I will never forget what you have done for me. Thanks so much. "Dr. Carlos Longa is at the top of his game. In fact, his entire team is at the top of their game. A small filling came out as I was chewing gum at 10:45 on a Tuesday morning. I called the office and Katrina asked if I could come in by noon. 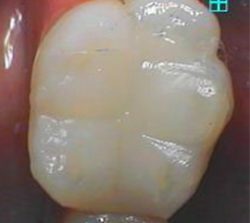 I could, and Dr. Longa and his assistant prepped the tooth and re-cemented the gold filling which the gum pulled out and buffed the tooth back to smoothness. I was back at my workplace by 12:30. Glen Park Dental have been taking care of my teeth for about 20 years. They're very accommodating and up to date on current techniques." From my first visit to Glen Park Dental, I knew I had found the perfect dentist for me. Dr. Dickerson Longa made me feel so comfortable and at ease, which had never been my typical feeling when going to the dentist. Her professionalism, personality and clear understanding of my issues caused me to feel very secure and confident that she was the right dentist for me. She knew what had to be done to resolve my lifelong issue with grinding and gum recession. She listened to my desire for a more beautiful smile. She took the time to explain every step of my procedure and made sure I was comfortable with it all. I was so impressed with the advanced technology they used to ensure my bite was in the right position, I could actually SEE that my muscles were comfortable! She and her assistant, Lowen, made sure I felt no pain and always made me feel I was the most important patient they had. I actually loved going to my appointments. The end result is nothing less than magnificent. My mouth is aligned in its proper position; I no longer grind whatsoever; my teeth are absolutely beautiful, and my smile is now the first thing people comment on when they meet me. I love my teeth and wish I had found Dr. Dickerson Longa years and years ago. She has truly made such a difference in my life. "I have suffered from headaches practically my entire life, so when Dr. Dickerson asked me if I had headaches after seeing the wear and tear on my teeth from my clenching, I downplayed my history. She suggested an orthotic and all I heard was ‘mouth guard,’ which I had already tried before without success and with much annoyance and frustration. I was very hesitant to entertain the idea of yet another contraption for my mouth. I blamed headaches on stress, genetics . . . life. But when she said I was beginning to show gum recession (after already having an incredibly painful surgery to repair it a few years ago) and that the orthotic should help, I reluctantly listened. I decided it would be cheaper to get the orthotic than have another surgery, so I agreed to be fitted for one. I have now had the orthotic for about 7 months and I cannot recommend it enough. The headaches I thought I was ‘stuck with’ for the rest of my life are completely gone. The orthotic is so small and unobtrusive that I wear it every night, and it causes none of the discomforts of the many mouth guards I’d worn in the past. I wake up completely pain free, a new one for me; and even the headaches I would get throughout the day are gone, though I rarely wear the orthotic during the day. As I said, I was very skeptical that the orthotic would help; I am now a believer. It definitely worked for me." "I can't say enough good things about Dr. Dickerson and the staff at Glen Park Dental. She is a gifted dental artist and the equipment and materials she uses is first rate. She did extensive bite analysis, removed my old veneers, fitted me with natural looking temporary "teeth" and several weeks later applied the new veneers to my total satisfaction. It is an investment that will pay off every day for the rest of your smiling life!" "As always, when I visit the Clinic everyone treats me as someone special. Dr. Longa is always upbeat and empathetic; he's a great dentist... I'm a happy BART commuter and it is so convenient that the clinic is right across the street from BART and at the corner of 3 different MUNI lines! How convenient is that?" "I called Glen Park Dental at 9am with a semi-emergent dental issue. I was seen at noon and given an evaluation. Dr. Dickerson worked me into her busy schedule at 3pm for an hour session. She fixed the problem and gave me the best possible outcome in terms of price and treatment. I rate her as being excellent in all respects. Highly recommended." "Dr. Tom has made my dental health better than ever. Thank you!!" "Friendly and welcoming clinic, very professional treatment, love the results!" "Glen Park Dental makes it as pleasant as it is possible to make a dentist visit. The staff are all competent, professional, friendly people who take the time to explain everything, so you're not left thinking, What just happened...?